Pati Palmer is an author, teacher, pattern desinger, and book publisher. McCall Pattern Company calls her their "Fit Expert." She holds 4-day workshops in Portland Oregon and also offers training to those wanting to teach sewing. Above Anna Mazur, me, Margrete Olsen, and Barbara Deane. To the right I am with Barbara Putko. I flew to Ct. to do an all-day event for the Connecticut Sewing Guild. 60 members came from all over the state as well as from New York. I gave a fit and pant fit class in the morning and measured those wanting my help for top and bottom sizes. We spent the afternoon on tips for making jackets. During a wonderful luncheon, I gave a keynote speech, titled Dreams on Paper as my whole life, it seems, has been about "paper." I write and publish books, design patterns for McCall's and even created an alteration tool called Perfect Pattern Paper for McCall's.Donna Flatley is this year’s president of the Connecticut Guild and did a wonderful job passing the torch to the next president during the luncheon business meeting. Donna is also a Certified Palmer/Pletsch Instructor who will be glad to do more teaching next year.I also met Anna Mazur, a handbag designer who is just starting a new venture selling her bags to boutiques. She is also a writer and amazing seamstress.Christy Glenn was there showing and selling her beautiful fashion fabrics which are available online. Contact her at plushcatdesigns@yahoo.com.Margrete Olsen chaired the event and did a wonderful job including keeping us all laughing. She has great stories to tell about growing up in Washington, D.C.The ASG treasurer, Barbara Deane, did a phenomenal job selling books for me--something you can't do while you are teaching! She is treasurer of the Guild and a bookkeeper too. Thank you! I am home now, but had such an invigorating time speaking to enthusiastic fashion sewers who live 3,000 miles from me. I am going to New York to present designs to McCall's. What women's pattern designs would you like to see? Pati is McCall Pattern Company’s "Fit Expert" and a columnist for the Sewing Today magazine. 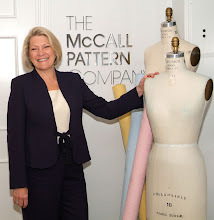 Pati designed Vogue’s FIRST pant fitting pattern in 1976 and has been designing for McCall’s since 1980. Her newest patterns have alteration lines built into the tissue and she personally writes the guidesheet and includes major fit help in her current McCall’s patterns. Get her free Fashion for REAL People newsletter which is free to subscribers at www.palmerpletsch.com . Palmer/Pletsch Sewing Vacations are held 10 times a year in Portland Oregon.